2016-08-01. New. Ships with Tracking Number! INTERNATIONAL WORLDWIDE Shipping available. Buy with confidence, excellent customer service! 2001-01-01. New. Ships with Tracking Number! INTERNATIONAL WORLDWIDE Shipping available. Buy with confidence, excellent customer service! 2016-08-01. Good. Ships with Tracking Number! INTERNATIONAL WORLDWIDE Shipping available. May not contain Access Codes or Supplements. May be ex-library. Shipping & Handling by region. Buy with confidence, excellent customer service! Addison-Wesley. Hardcover. 0805385665 New Textbook, Ships with Emailed Tracking from USA . New. Pearson. Hardcover. 0133977226 Like New Condition. . Fine. Pearson. Hardcover. 0133977226 New Condition. . New. Pearson. Hardcover. 0133977226 NEW TEXTBOOK, SHIPS WITH EMAILED TRACKING FROM USA . New. 1997-08-07. New. Ships with Tracking Number! INTERNATIONAL WORLDWIDE Shipping available. Buy with confidence, excellent customer service! 1974-07-08. New. Ships with Tracking Number! INTERNATIONAL WORLDWIDE Shipping available. Buy with confidence, excellent customer service! Pearson. Hardcover. 0133977226 US Edition Textbook, May Have Highlights, Notes and/or Underlining, BOOK ONLY-NO ACCESS CODE, NO CD, Ships with Emailed Tracking from USA . Good. Pearson. Hardcover. 0133977226 BRAND NEW W/FAST SHIPPING! 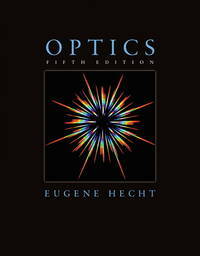 This item is: Optics, 5th Ed., 2016, by Hecht, Eugene; FORMAT: Hardcover; ISBN: 9780133977226. Choose Expedited for fastest shipping! Our 98%+ rating proves our commitment! We cannot ship to PO Boxes/APO address. To avoid ordering the wrong item, please check your item's ISBN number! . New. Pearson. Hardcover. 0133977226 ****** . Very Good. 2001-01-01. Good. Ships with Tracking Number! INTERNATIONAL WORLDWIDE Shipping available. May not contain Access Codes or Supplements. May be ex-library. Shipping & Handling by region. Buy with confidence, excellent customer service! Addison-Wesley, 2001-08-12. 4. Hardcover. Used:Good. Addison-Wesley. Hardcover. 0805385665 Like New Condition. . Fine. Addison-Wesley. Hardcover. 0805385665 New Condition. . New. Addison-Wesley. Hardcover. 0805385665 US Edition Textbook, May Have Highlights, Notes and/or Underlining, BOOK ONLY-NO ACCESS CODE, NO CD, Ships with Emailed Tracking from USA . Good. 2011-01-01. New. Ships with Tracking Number! INTERNATIONAL WORLDWIDE Shipping available. Buy with confidence, excellent customer service! Paperback. New. Brand New Softcover International Edition, Have same content as US Edition. ISBN is different. Never Used, in English Language. Printed in Black and White. 100% return and refund. New Item, Softcover International Edition, Have same content as US Edition. ISBN And Book cover may be different. Not a Used Book, Book Language:English. Printed in Black and White. Excellent customer service response. Pearson Education Limited. PAPERBACK. 1292021578 Brand new book. International Edition. Ship from multiple locations. 3-5 business days Express Delivery to USA/UK/Europe/Asia/Worldwide. Tracking number will be provided. Satisfaction guaranteed. . New. Pearson, 2016-01-02. Softcover. New. ***International Edition***Soft cover/Paperback*** Textbook printed in English. ***Brand New***. International edition has different ISBN and Cover design. All textbook arrives within 5-7 business days. Addison Wesley, 2001-08-12. Hardcover. Good. Addison Wesley. Used - Good. Ships from the UK. Former Library book. Shows some signs of wear, and may have some markings on the inside. 100% Money Back Guarantee. Your purchase also supports literacy charities. 1974-07-08. Good. Ships with Tracking Number! INTERNATIONAL WORLDWIDE Shipping available. May not contain Access Codes or Supplements. May be ex-library. Shipping & Handling by region. Buy with confidence, excellent customer service! Addison-Wesley, 2001-08-12. Softcover. New. ***International Edition***Soft cover/Paperback*** Textbook printed in English. ***Brand New***. Most international edition has different ISBN and Cover design. Some book may show sales disclaimer such as "Not for Sale or Restricted in US" on the cover page but it is absolutely legal to use. All textbook arrives within 5-7business days. Please provides valid phone number with your order for easy delivery. Pearson Education. Used - Good. Shows some signs of wear, and may have some markings on the inside. 1997-08-07. Good. Ships with Tracking Number! INTERNATIONAL WORLDWIDE Shipping available. May not contain Access Codes or Supplements. May be ex-library. Shipping & Handling by region. Buy with confidence, excellent customer service! brand new.International Edition. Softcover. Ship by Fedex/DHL global express service to US/Canada within 3-5 business days.4-6 business days for shipping to worldwide. We can't ship to Po Box,APO and FPO address.SoftCover written in English, Different ISBN and Cover Image from US Edition ; Sometimes, the title is different than with US Edition, and the exercises and homework problem are in different orders, Contents and Chapters may be will different than US Edition,Some books may show some sales disclaimer word such as Not for Sale or Restricted in US on the cover page. Mc Graw Hill India. PAPERBACK. New . New Book. Shipped via DHL/FEDEX with tracking ID. New York, New York, U.S.A.: Macmillan Pub Co, 1987. Hardback in near fine condition with near fine dust jacket, protected in clear mylar jacket sleeve.. Hardcover. Near Fine/Near Fine. Paperback. Book conditions is Brand New Paperback International Edition. English language.Ships To US and Canada By DHL And Delivered In 4-6 Days. Paperback. New. Book Condition is in New Paperback Eastern Economy Edition/Indian Edition textbook with identical content as the US version. May have been Printed in India with cover stating Not for sale in US. Fast shipping through the DHL, FedEx, Aramex And Delivered In 5-6 Days to all worldwide. New York, New York, U.S.A.: Macmillan Pub Co, 1987. Hardback in fine condition with fine condition dust jacket.. Hardcover. Fine/Fine. Mc Graw Hill India, 2011. Paperback. New/11. Brand New International Edition, and has never been opened,Perfect condition, Satisfaction Guaranteed !!! Addison-Wesley. Hardcover. 0805385665 Brand New Paperback International Edition. Fast Delivery. Same Contents as US Editions. ISBN and Cover might be different in some cases. Delivery in 4-14 Business days . New. 2008. International Edition . Soft cover. New/New. Book Condition: BRAND NEW. International/Eastern Economy Edition, Paperback/Softcover with SAME TITLE, AUTHOR AND EDITION as listed. ISBN and Cover design differs. **100% IDENTICAL CONTENTS as U.S Edition**. Standard Delivery within 7-14 business days ACROSS THE GLOBE. We can ship to PO Box, APO address in US. International Edition Textbooks may bear a label (Not for sale in the U.S. or Canada) or (For sale in Asia only) or similar restrictions- printed only to discourage students from obtaining an affordable copy. US Court has asserted your right to buy and use International edition. Access code/CD may not provided with these editions. We may ship the books from MULTIPLE WAREHOUSES ACROSS THE GLOBE including Asia depending upon the availability of inventory. Printed in English. Customer satisfaction guaranteed. 2008. International Edition . Soft cover. As New/As New. Book Condition: BRAND NEW. International/Eastern Economy Edition, Paperback/Softcover with SAME TITLE, AUTHOR AND EDITION as listed. ISBN and Cover design differs. **100% IDENTICAL CONTENTS as U.S Edition**. Standard Delivery within 7-14 business days ACROSS THE GLOBE. We can ship to PO Box, APO address in US. International Edition Textbooks may bear a label (Not for sale in the U.S. or Canada) or (For sale in Asia only) or similar restrictions- printed only to discourage students from obtaining an affordable copy. US Court has asserted your right to buy and use International edition. Access code/CD may not provided with these editions. We may ship the books from MULTIPLE WAREHOUSES ACROSS THE GLOBE including Asia depending upon the availability of inventory. Printed in English. Customer satisfaction guaranteed. Mc Graw Hill India. New. Very good condition. Mc Graw Hill India. PAPERBACK. 0071321160 . New. Pearson India, 2008. Softcover. Brand New. Orders usually ship within 1-2 business days. We use FAST SHIPPING via FEDEX/UPS/DHL and deliver within 3-5 business days with tracking number, no shipping to PO BOX, APO, FPO addresses. Kindly provide phone number for expedite delivery. 100% Customer satisfaction guaranteed! Seller: CHALLENGE BOOK STORE PVT. LTD.